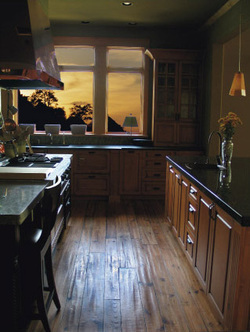 Palo Duro Hardwoods of Denver, Colorado is proud to introduce the Palo Duro Collection. The finest hand-scraped products in today's marketplace. The Palo Duro Collection should not be mistaken for reclaimed, recycled or antique flooring products. We produce a product that utilizes new growth timber to create an old world look. All of our products are kiln dried to between 5-8% moisture content and are stored and produced in a climate controlled environment. This ensures a finished floor that will be consistently more stable and easier to install. Our Collection offers selections in Cherry, Hickory, Heart Pine, Jatoba, Walnut, Wormy Maple and White Oak. All products are available in Engineered versions with the exception of Heart Pine. Our Collection is available in face widths between 3"-7". Larger face widths can be acquired. All solid products are tongue and grooved, are back relieved and end matched. Lengths for solid products carry a two-foot minimum with the average lengths between six and eight feet. Engineered products are available in 3”-6” random widths or 5-1/2" single width plank. Lengths in the 3”-6” engineered average between 4’-6’ and all single width 5 1/2” boards are 7' 2-5/8" long. The thickness of the engineered products is 5/8". All Solid products are produced from a rustic grade of lumber. These products will contain, but not be limited to: mixed grain, variable natural color, burl and sound filled knots. Please allow 7-10% for cutting waste.Our craftsmen do all scraping and distressing by hand, no machinery is involved. All products are created with a single appearance in mind; this delivers quality and consistency you can count on. We also produce tread and riser stair parts to accompany your job and match your floor. Lead times may vary dependent on materials availability and job size. Average lead time is four to seven weeks.